Have you ever seen anything so lovely and homemade you stop dead in your tracks and say, I must LEARN this? Well that happened to me the other day. I came across the most beautiful blanket I've seen in a long time. 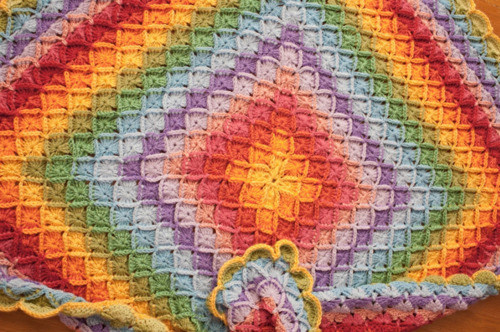 The colors were absolutely stunning, and it featured a stitch I have not yet tried in crochet. It's called the Bavarian Stitch. Some people call it the Catherine Wheel or the Yarn Eater as well. Check out this blanket, it is amazing! It is from the blogger over at MadMe. I am in Awe. Check out her site she has more pictures of this blanket, which you will want to gaze at endlessly. Photo by MadMe. All rights reserved. I would definitely consider the Bavarian stitch (now that I've tried it) an advanced stitch. 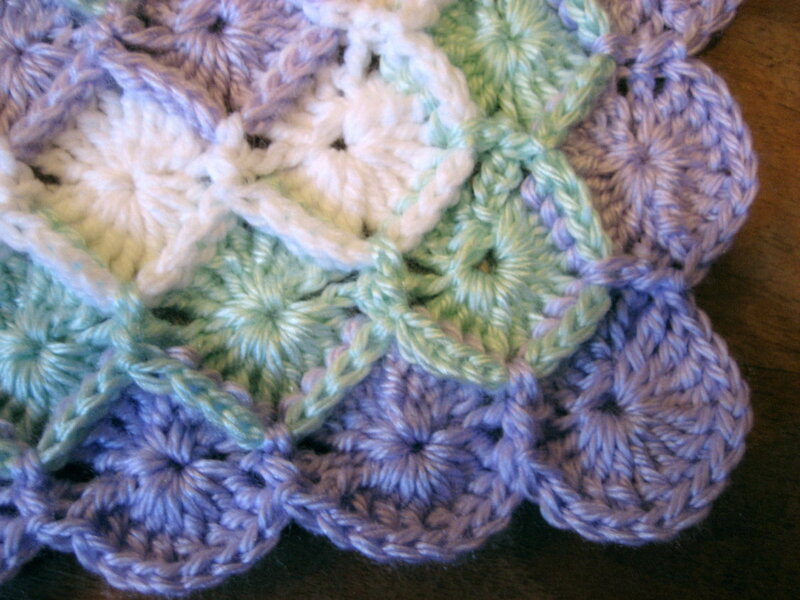 There are cluster stitches, and some of the time up to 8 loops on your hook (relatively rare for crochet). If you want to see Teresa's tutorial on it, click here. So I just grabbed some soft extra yarn I had lying around and decided to try it today. I was able to do the center (the first two rows) in white, then switched colors to a soft pink. After two rows of pink were finished (two rows make one "wheel) then I added a third color of light green. I figured out this stitch is even slightly different than a regular Catherine Wheel in that the variation of crocheting around the posts of the row in front gives it the cool raised ridge effect. Tricky to master but pretty when every thing is said and done. So that is as far as I got. I sure hope I am doing it right. I was having a hard time with row five, so I did my best guesstimation off the pattern and just kept going. Now I need to decide if I start the pattern over with white or add a 4th color... decisions decisions... I'll keep you posted. Very pretty! I know this is an old post... you're probably really good at this now!